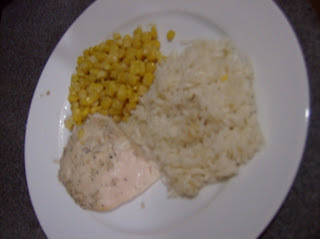 Single Girl Gourmet: Slow cooker chicken & rice - double fail! Slow cooker chicken & rice - double fail! Right about now I'm thinking why did I get a crock pot because clearly I have no idea how to use it. Or maybe I should follow the recipes more closely until I figure out what I'm doing. So when I first got my crock pot, I was browsing around for some recipes to try it out and on mixingbowl.com I saw a recipe for lemon chicken. Looks yummy right? Well somewhere I went awry. I did not use bone-in chicken breasts but boneless, however, the chicken wasn't dry at all so I don't see why that would be an issue. I did not like flavor the rice had, it was sort of like chewing wine. It could be the wine I used, maybe I just did not like the flavor it had and reducing it in the crock pot would have concentrated the flavor in the rice. The taste of the chicken was also a little bland. I would have expected, it to be flavorful with the lemon, wine and spices being slow cooked into it but it definitely wasn't. I also found the cooking time to be challenging - not quite long enough to be made while I'm at work! Despite this I persevered! I tried to make chicken and rice in the same spirit of this recipe but with different flavors, that I might like more because I like chicken and rice when other people make it! 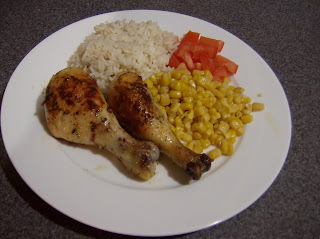 A friend of mine used to make a Latin American style of chicken and rice where she would cook the rice in the stock created by cooking the chicken. So I used all the same spices but instead of wine, lemon juice and water; I used chicken broth and a bit of water. I also switched to chicken on the bone, mostly because it's what I had around. This was if possible a larger failure! Yes, I know it looks tasty in the photo, looking at it now kinda makes me want to eat it, but trust me it was not good. Despite being cooked for 8+ hours when I got home the chicken wasn't done! Seriously? Seriously. I took the half-cooked chicken out and pan fried it for what seemed like forever before I could finally eat it and still the rice and chicken were sort of blah. I will find a recipe for chicken and rice that works. I will successfully make dinner with my crock pot while I'm at work. I will. Rice and slow cookers = BAD IDEA. I have since made a couple of soups successfully with the slow cooker (posts coming soon) and have plans to branch out past soup now that I've made something edible!